Hi guys. This week I’ll be posting two short articles in time to help with your holiday entertaining needs. Today’s article is an idea that my mom had to modify this recipe for rosemary and strawberry scones turning it into a holiday treat. Just be sure to watch anyone who shows up with a large purse very closely. Once they try them, the temptation to shovel the rest into their handbag may be overwhelming. First let me say that the original recipe is great on its own. 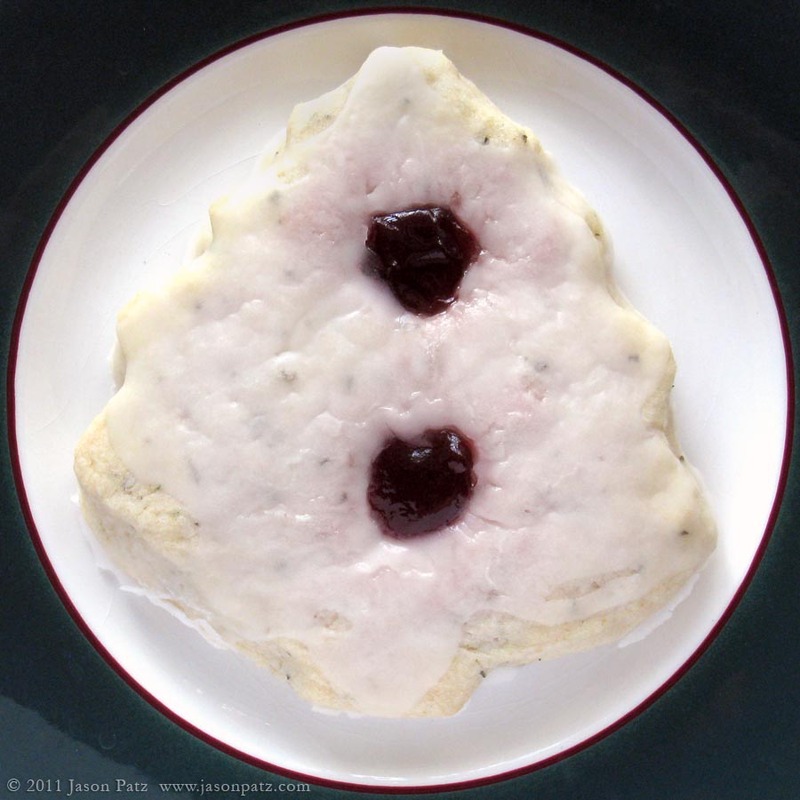 The combination of the sweet fruity strawberry jelly and the bright lemon icing counterbalances the robust woodsy rosemary flavor creating a scone that is unexpected, complex and delicious. When you add the Christmas tree shape, it just makes things better. Step One. 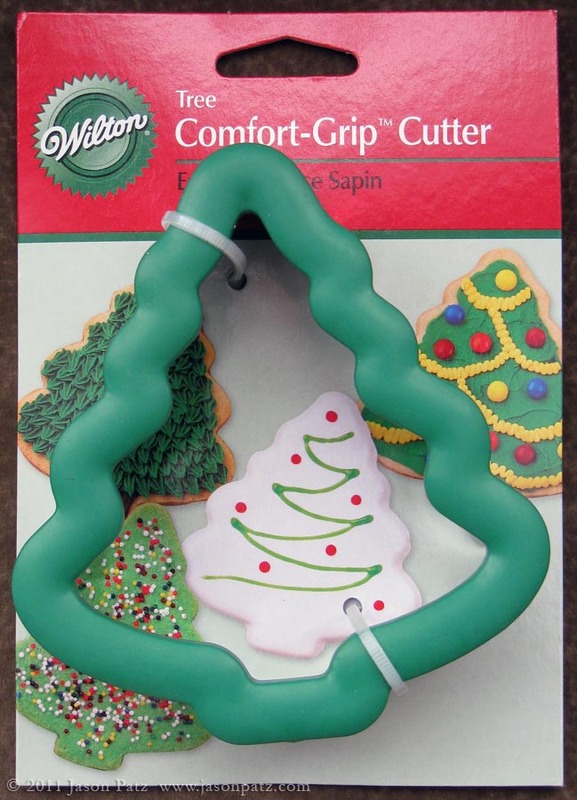 Get a four inch Christmas Tree Cookie Cutter. I noticed that Williams-Sonoma had them for $7 but I found one that worked just fine at a Michael’s craft store for $4. They appear to be a seasonal item and were on an island display in the front of the store I visited. Step Two. Get this rosemary and strawberry scone recipe. Step Three. Follow recipe as directed substituting Christmas tree cookie cutter. Pay attention to the icing notes below. * Makes twelve Christmas tree scones. 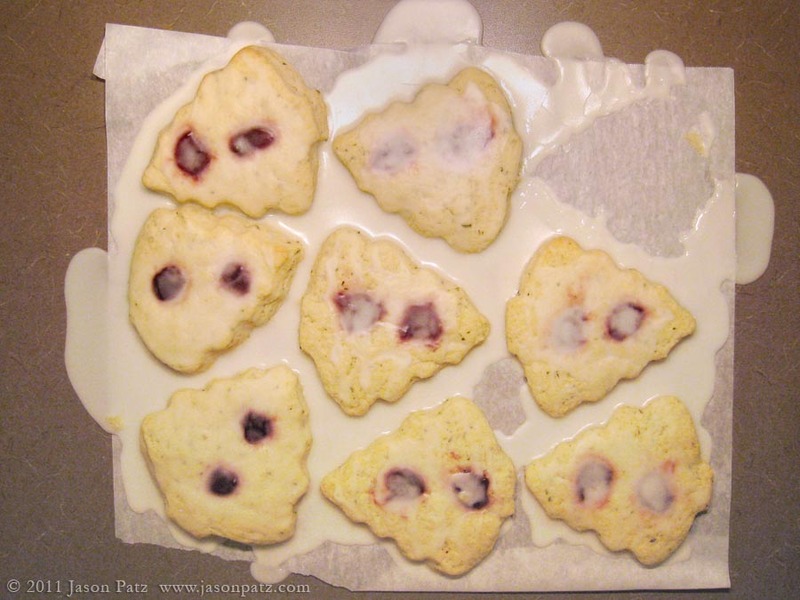 * Scones look better without icing but may not be sweet enough for some palettes. * Recommend adding lemon juice slowly to the powdered sugar for icing. In my case, I didn’t need any additional water and would have preferred even a little less lemon juice so that the icing would have been stiffer and could have been drizzled on the sconces (like a white garland) instead of having something so runny that it made an even coating over the whole cookie. * If you don’t use a ruler when rolling out your dough, I recommend guessing a little thicker than 1/2″ instead of thinner. The scones have a better feel at this size – a little more scone-y and less cookie-ish. * Offset the Christmas ball jelly ornaments instead of lining them up like I did. I was afraid to get them too close to the edge of the cookie but the jelly didn’t really spread at all during cooking. Unfortunately, it does stain the white icing around it making the scones look a little bruised once the icing is applied. * I tried substituting raspberry jelly thinking that it might be more Christmas flavored. It is fine but strawberry is better. Overall, this recipe is extremely easy. It is certainly no harder than making chocolate chip cookies, but the sophisticated flavor will have your party guests spoiling their appetites if you put them out before dinner is served. Hooray for holiday gluttony!